"That's why it's so important to remain skeptical, to reexamine assumptions, to consider alternatives. If we are going to make progress, we have to be willing to acknowledge and confront our cognitive biases. What we are doing and why, how we are doing it and where, who we are working with and when. We have to lose the courage of our convictions and open up to being wrong. Remaining skeptical doesn't mean that you have to become a cynic." Tim Ogden, "Losing the Courage of Your Convictions," Stanford Social Innovation Review, August 10,2012. There is a lot packed into this provocative and insightful posting. 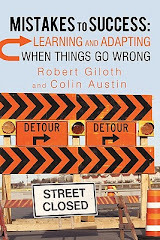 We in the social sector have to become much more comfortable with learning from mistakes, constructive failure, and speaking against convention. This isn't just a matter of moral or philosophical belief; we need to train ourselves and our organizations to do this. It's unnatural. Take a look at Mistakes to Success and Mistakes Roadmap at www.mistakestosuccess.org. You will also need a different kind of courage, a courage to withstand the charge of cynicism and not being one of the team, especially for beloved projects and investments.